The weekend of Friday, July 12th to Sunday July, 14th will see Rochester and the wider Medway come alive for what's being termed Medway's Big Weekend. 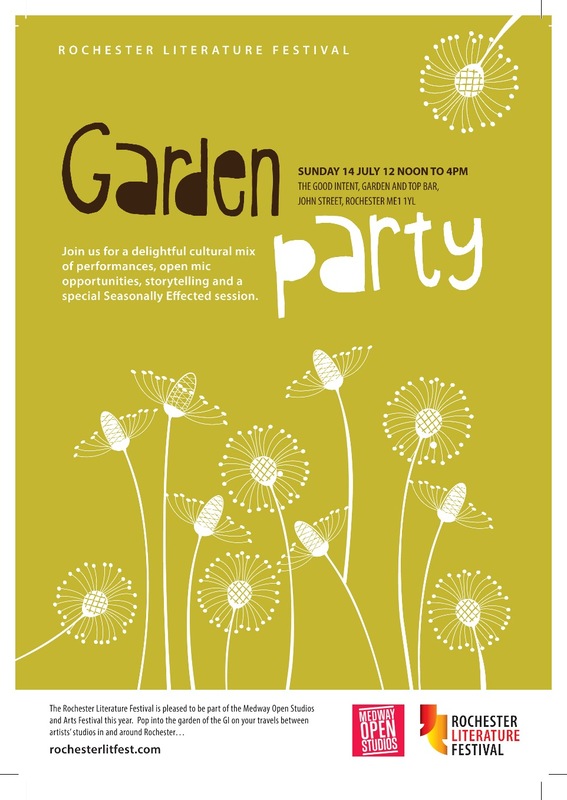 Having made a fantastic debut at Eastgate House Gardens last year, The Rochester Literature Festival (RLF) is this year holding its Summer Garden Party on Sunday 14th July, at the Good Intent Pub in John Street, Rochester, between 12noon and 4pm. They invite you to join them for a delightful cultural mix of performances, open mic, storytelling and a special edition of Seasonally Effected. For the first time, the RLF is a part of the Medway Open Studios and Arts Festival, which begins on Saturday, July 13th. If you're out and about on the Sunday, pop in to the garden of the Good Intent on your travels between the artist's studios in and around Rochester. The RLF are excited to have with them those wonderful folk, ME4 Writers, who will be in situ in a new WordShed, following a very successful stint at Fuse Festival. They will be joined by another Fuse Festival debutant, the CreataboX. Over 111 mini pieces of art were distributed over the Fuse weekend by this latest creative endeavour from Natasha Steer of Creatabot, with the help of Ed Jennings (Tea Concerts) and artist Richard Jeferies. The success does mean that more miniature art (be it visual, textile, sculpture, photography, writing - anything at all) would be gratefully received. You can submit your pieces (no more than 9cm in diameter) to Natasha c/o coFWD, 161 High Street, Rochester ME1 1EH. The Big Weekend will begin with music festival, Homespun, which runs on Friday 12th and Saturday 13th. A collaborative effort between local promoters Tea Concerts, Motherboy, Medway Eyes and Suburban Kings, it aims to celebrate live music locally and if successful, become an annual event. There is also a folk music festival at the Good Intent on Saturday 13th, with the Rochester Acoustic Music Day promising over 20 acts. Most of Medway's creative collaborations have formed over the past three years, following the instigation of the Tuttle coffee morning in Medway by designer, Carl Jeffrey. Having grown into the community now known as coFWD, its current habitat is the coworking and participatory space at 161 High Street, Rochester, where the paths of most of the above cross on a frequent basis.